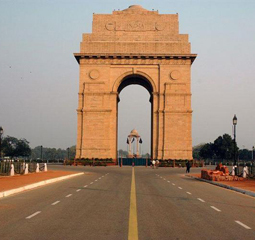 Arrive in Delhi and transfer to your hotel. Explore Old Delhi on a rickshaw ride through the lively streets and wander the largest mosque in India, the Jama Masjid, and the classic Moghul-style Humayan’s Tomb. Discover culinary delights walking past bread and sweet shops. Join the proud Sikh people at a thriving local temple and see the colonial grandeur of New Delhi. Enjoy some free time to wander the blend of traditional stalls and modern boutiques around Connaught Place. Drive to Agra and explore the Red Fort with your first views of the distant Taj Mahal. The next morning, visit this iconic monument to love as the magical dawn hues fall across the great white marble domes. Board the world’s greatest train network bound for the rugged beauty of Ranthambore National Park. 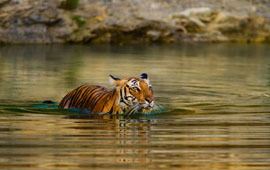 Embark on game drives in the early morning and late afternoon, the best times to spot wildlife such as deer, crocodiles, wild boars and with luck, the Bengal Tiger. Visit a local traditional milk market and then unravel the royal history of the stunning Pink City at the Hawa Mahal or Palace of the Winds. Venture out to the vast hilltop Amber Fort, amidst stark desert hills. Wind your way through the colourful markets at your own pace to dig up a bargain and see traditional artisans at work. Arriving in the traditional town of Nimaj, explore the Rajasthani countryside on a unique jeep safari and spend the night at Nimaj Palace. Absorb delightful rooftop views, take tea in the courtyard, or wander the town, before a cooking demonstration by your royal hosts. Journey into the Thar Desert, where a luxury desert camp perched high on the dunes is your home for the night. Watch the sun slip below the horizon in the tranquil desert on a sunset camel ride. 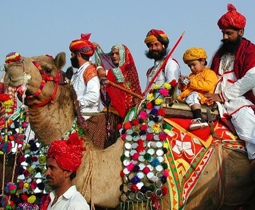 A desert jeep safari takes you to fascinating Bishnoi tribal villages, bursting with colour and alive with activities like blacksmithing, pot-making, weaving and farming. In the Blue City of Jodhpur, wander the towering Meherangarh Fort and the town’s vividly colourful bazaar. A scenic drive through the Aravali Hills takes you to enchanting Udaipur, one of the world’s most romantic cities, stopping at the World Heritage listed Jain temples at Ranakpur. Wander the lakeside streets, the bustling bazaars, and the ornate cupolas and balconies of the City Palace. A boat cruise offers views of the fairytale Lake Palace rising from Lake Pichola. Shop for one of the city’s famed artworks in your free time and experience Udaipur’s colourful local life. On your last day, enjoy free time before your departure transfer.